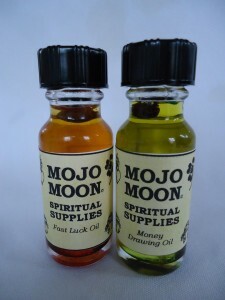 Introducing a new line of Spiritual Condition and Anointing Oils from Mojo Moon Spiritual Products! I am proud to announce two of the best and most effective positive spiritual anointing oils based on my studies of traditional Southern Louisiana style conjure and hoodoo. Made with 100% all natural herbs, roots, minerals and essences, these oils are safe for you and safe for the environment. In a crystal clear 1/2 ounce bottle, you can be assured of quality products that will last a long time. 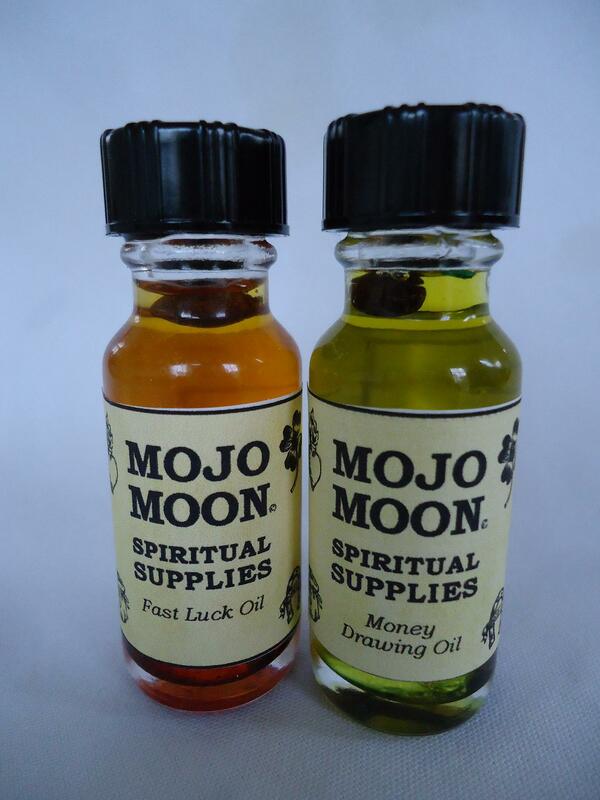 Mojo Moon Money Drawing Oil has all the essences and herbs associated with traditional Southern Style folkloric beliefs for bringing in money to the home and pocketbook or wallet. It has a golden green color and you can see the actual herbs and roots floating in the oil through the clear glass bottle. Anoint the corners of your greenbacks, your hands before handling money or your paycheck or on green candles to bless the household with necessary money. Mojo Moon Fast Luck Oil is blended based on traditional old style recipes that have been passed down through the generations to incite and attract Fast Luck when placed on a red candle, on your fingertips and passed over your body, leaving a thin veil of scent to work as a secret magnet for luck to come from all forms straight to you. A little drop or two will suffice when blessing and sealing yourself for the day.